I've been in Japan almost three weeks now and I am still yet to have a single piece of sushi. Perhaps that's testament to how strongly Okinawan cuisine differs from standard mainland cuisine? Almost everywhere I go offers the ever ubiquitous taco rice, a selection of bento boxes and curries, Okinwa soba (not to be confused with mainland Japanese soba), sea grapes, goya champuru, a bewildering array of pork dishes, sweet-potato-flavoured-everything (even ice cream), and more. Yet the sushi section at the local supermarkets is barely the same size as that of Woolworths or Coles (in fact, they are probably eclipsed by the made-to-order sushi bars found in some Woolworths stores). To be fair, we did pass one ¥100 sushi train near Chatan, and a small selection were sold at Ajijiman izakaya but apart from that I've rarely come across any. Ah well. I still have plenty of time ahead in mainland Japan. Apparently Japan is battling a butter shortage emergency - this explains why it's been so difficult to find butter the past couple of weeks! You can buy eggs in cartons of 12, 6, 3, or even 1. Yes, you can buy a singular egg if you are so inclined. Frozen must have become really massive over here. Almost everywhere you go, you see Frozen related merchandise, from stationary and books to unrelated confectioneries that decided to forgo their own packaging and logos and instead capitalise on the Frozen characters. 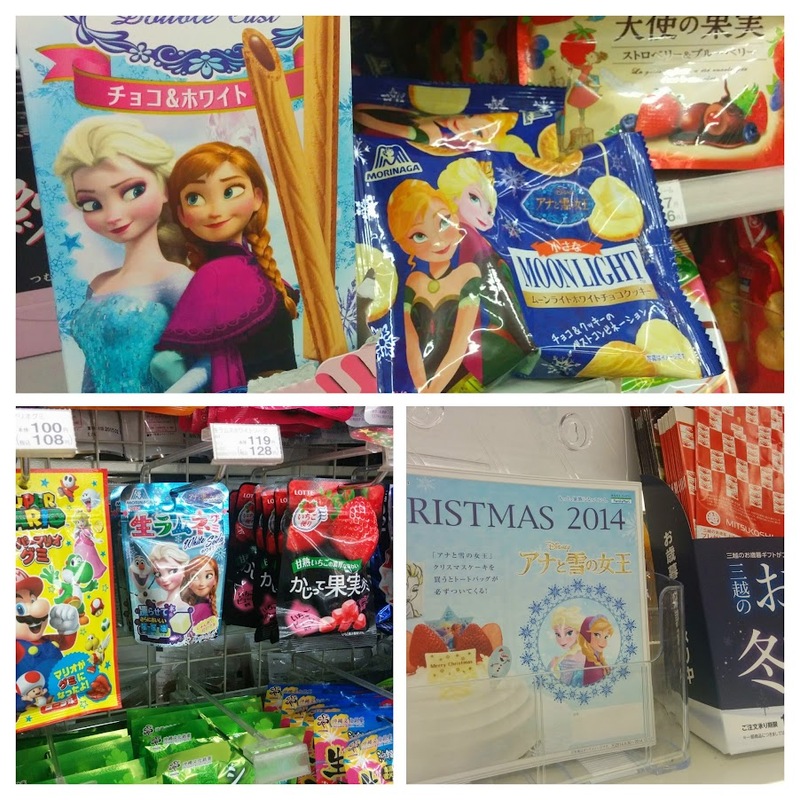 The Frozen section in Daiso even manages to overtake the Hello Kitty section, which is no mean feat. I think I'm becoming a little too used to the heated toilet seats. The other day I become unreasonably annoyed when I sat down and discovered the toilet had gone into 'energy saving mode' (a cold toilet seat?! How utterly offensive). In any case, China/Mongolia/Russia will be a wake up call to my elevated toilet standards. I didn't realise how truly massive the American presence is here, until we accidentally almost entered a beach resort reserved for American servicemen. As there are more than 20,000 Americans stationed here, the Kadena Air Base is almost like an exclave of the US itself, with schools, libraries, restaurants, bars and more, all accepting US dollars and having US telephone numbers. This even leaks into Okinawa City and Chatan slightly, with business there readily accepting US dollars. At 1:46 they even give you directions from Naha in the form of a rap (yes, rap) song. How great is that?! 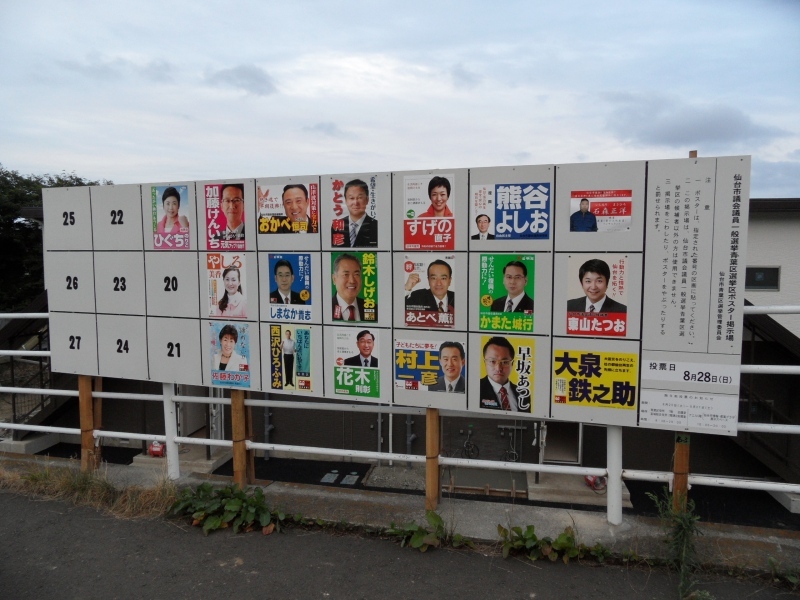 On the topic of things I haven't noticed (a strange deviation, but bear with me) is the 2014 Japanese National Election. This took place today, and apart from numbered election poster boards springing up all over the island - providing a very clean, logical and bureaucratic method of political advertising - I've barely noticed. Perhaps it's because I don't have access to Japanese TV and radio (we've been listening non-stop to AFN, the American Forces Network, live from Kadena Air Base! ), our rural location, or the fact that more than half of OIST is composed of foreigners. Or you could argue it's my complete lack of comprehension of Japanese (probably mostly this). ... okay, I'm starting to realise why I feel out of the loop regarding this election.